The Restore Order Detail tab lists the order in which tables will be written to Salesforce according to the list specified in the Restore Order tab. The following examples reference the screenshot below. If a table name appeared in the Required Prerequisites column for Account it means that CopyStorm/Restore’s table scanning algorithm decided to write Account records to Salesforce even though the Account table contains a non-nillable reference column referencing a table later in the list of tables to be restored. In practice, this should never happen in a plan built by CopyStorm/Restore. However, if it does, this plan will show the issue and allow overriding Salesforce dependencies to fix the problem. If a table name appeared in the Nillable Prerequisites column for Account it means that CopyStorm/Restore’s table scanning algorithm decided to write Account records to Salesforce when the Account table had a nillable column referencing a table later in the list of tables to be restored. 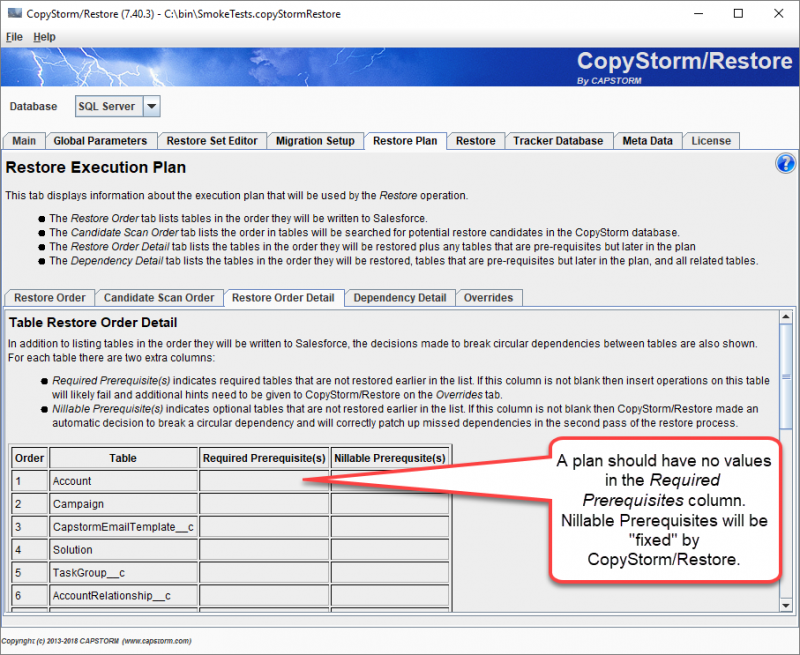 This condition happens fairly frequently in Salesforce, and CopyStorm/Restore attempts to reduce the impact on restoration performance by optimizing table ordering. This condition is not an error but means that CopyStorm/Restore will patch up nillable reference fields in a second pass, after the records have been restored.